Bee populations have been dying at a rate which the US government says is economically unsustainable. Honey bees pollinate plants that produce about a quarter of US consumer foods. In fact, some recent articles have said the rate of honey bee losses in the US are ‘economically unsustainable'; according to a report by the US Department of Agriculture, losses of managed honey bee colonies in the US totaled 23.2% last winter. The report, produced with industry group the Bee Informed Partnership, showed that the death rate for October 2013 to April of this year was better than the 30.5% losses for 2012 to 2013, but worse than the 21.9% in 2011 to 2012. Prior surveys found colony losses averaged 29.6% over the last eight-year span. So what do we as consumers do? There really hasn't been a very good eco-friendly option for honey-like products out there in the market....until now. 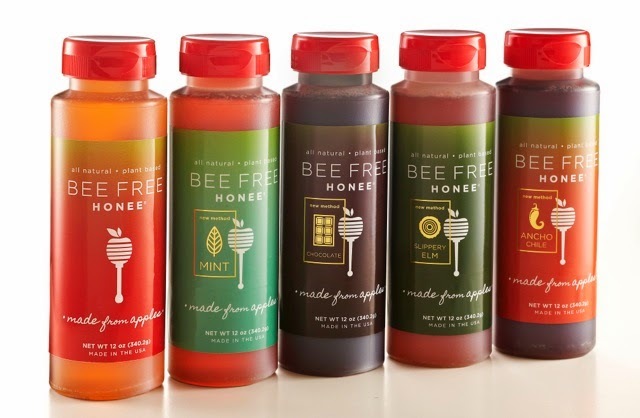 Enter Bee Free Honee - a local family-owned, green company based in Minnesota leading the movement to create a "honey" free of bees. 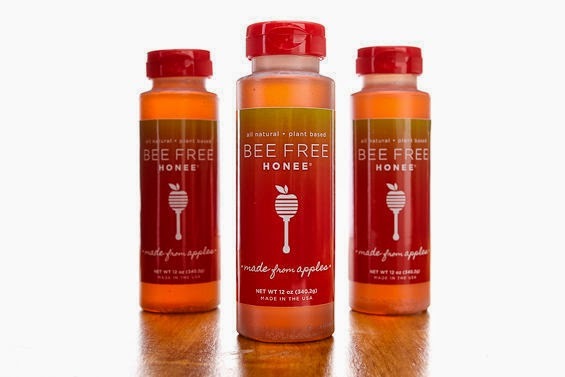 Bee Free Honee is made in Minnesota and using strictly US grown, organic apples. Bee Free Honee is the brain-child of Katie Sanchez. Katie’s love of cooking started when she was young. Growing up in Mound, MN, her family had an apple orchard in their front yard and her father (ironically) was a bee keeper. For her tenth birthday gift, she asked to be able to cook dinner for her family, on the stove and by herself. Cooking has been her passion for as long as she can remember. Pastries were her preference, but at the time pastry schools were far less common and much more expensive. So she decided to go to cooking school in Louisiana. She worked on a line while looking to get her foot in the door of a pastry department. That opportunity came at D’Amico Cucina, in Minneapolis. There she had the privilege of working as the assistant to Pastry Chef Leah Henderson and under Chef Jay Sparks. After three years, she left to go to work at an all natural bakehouse in St. Paul. There she worked with vegan products and learned about the all natural foods world. On more than one occasion she wished she could use honey in some of the vegan items. The vegan sweeteners were so strong they would often mask subtle flavors such as vanilla or hints of lemon. One day in 1999, while trying to make a less sweet version of apple jelly and being a novice with jelly, Katie accidentally created something that was definitely not jelly. Not wanting to be wasteful, she ‘canned’ it only to discover in the morning, that what she had was honee! Years later when she heard about the decline of the bee population, she asked herself two questions, could she reproduce her honee and was there a market for it? She went back to the kitchen and after much trial and error she was able to say that she had a solid recipe. Four years later, when she entered the market she did so with a website, a distributor, and three stores that carried her product. We are excited to see what is to come and we are thrilled that you are along for the ride. Bee Free Honee is taking the right steps to become a cost effective solution to the continued pollinator crisis that ties into an agriculture crisis. However, they (and we) don't want to just stop there...read more about What We Know About The Bees...And Other Pollinators on their website and tell your family and friends about the ongoing crisis, get sweet on BFH by following them on Facebook, Twitter and Instagram and of course find a retailer near you to try out some Bee Free Honee for yourself!